Yearlings by young and unproven sires can be a risky investments, but those by proven sires tend to be more costly. Consequently, weighing the risks against the potential returns may seem like a rock and a hard place situation for value-seeking buyers at the yearling sales. 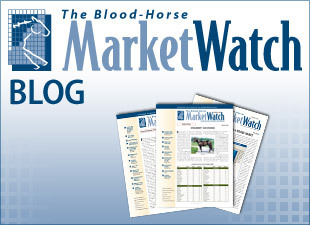 MarketWatch looked at first- through fifth-crop yearlings at Keeneland September from 2002-11 to determine which crop offered the best ROI for buyers based on sales price and eventual racetrack earnings. While no crop offered a positive ROI for all yearlings sold, third-crop yearlings had the best ROI at -9.4%. Fifth-crop yearlings were the worst option for buyers, posting a -22% ROI. Since better racemares tend to be better producers, yearlings out of these mares usually bring higher prices at auction. Taking the same pool of yearlings used in the above graph, MarketWatch organized all first- through fifth-crop yearlings by their dams' level of best race to determine which group offered the best return for yearling buyers. Yearlings out of grade I-winning mares easily brought the highest average prices, but their ROI of -54% suggests that prices have more to do with potential breeding value than with potential racetrack earnings. The highest ROI actually came from yearlings out of winning mares, and with an average price 65% lower than that of yearlings out of grade I winners, they generated the only positive ROI of any category at 1.5%. Looking specifically at third-crop yearlings (the crop that recorded the best ROI) by dams' level of best race, the graph below shows that yearlings out of winning mares offer the highest ROI at 14%. This year's catalog has 93 yearlings that are by third-crop sires and out of winning mares, including 17 by current leading second-crop sire Pioneerof the Nile.